Yesterday morning I woke up with a head cold, or what people here call “Gripe.” I am under the impression that Gripe is a catch-all phrase for any kind of illness from a cold to a full-blown flu. My symptoms are that of a bad cold and with a slight fever, but I am on the mend. I am in good hands this weekend while battling gripe. My Dominican friend has taken me to his house where he and his mom are taking care of me. His mom made a traditional lunch today with rice, espaguetti Dominicano, a salad with boiled eggs, tayota (Chayote), carrots, and potato, and stewed chicken feet. 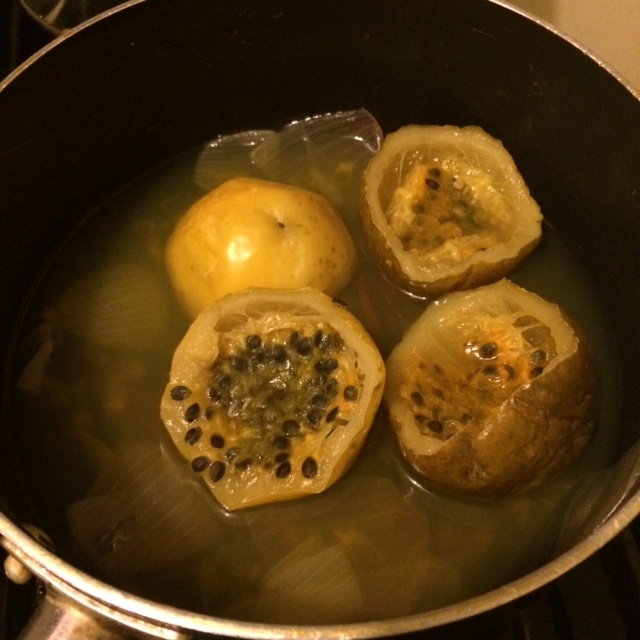 This afternoon, he made me Chinola tea which is a popular remedy for illness due to the fruit’s large content of Vitamin C. It is made by boiling cinammon sticks, chinolas (passionfruit) and onions. Here’ s a great recipe for Chinola tea on the Wanderlust and Lipstick blog. Overall, being sick here is preferable to being sick in New York. The weather is warm and there are plenty of fresh fruits to eat. I remember in New York, my colds and coughs would linger, I think in part to the colder air. Here, people strongly believe you can get sick or prolong a healing process with exposure to cold air. For example, people blame sicknesses on having had too much exposure to Air Conditioners. I have been told not to walk around without sandals on a tile floor, since my cold feet would prevent me from getting over an illness. Additionally, Dominicans avoid “sereno” or the night time air, when they are sick, for fear of making their symptoms worse. We do not have this concept in the states as it is often cold and there is no way to avoid it. Regardless, I’m sure I will be feeling better soon! In other news, I just registered for Spanish classes, and I’m moving apartments (again) next week. I will write more at that time. I hope all of my readers are well. Besos! Nice to meet you too! I’m glad that you found me through your friend, it’s great to connect with other people who blog about the DR.